A few months ago, I told you guys about my good friend Maegan. Maegan's older sister, Nicki has been my best friend for over eleven years. I met her the first day I moved to Arizona and we have been best buds ever since. Nicki is a fantastic and patient person. After being married 7 years, living on both coasts in multiple tiny apartments, she and her husband have finally been able to put down roots and buy a house. And the best part? It's less than 20 minutes from me! Her sister Maegan and I decided such an beautiful person deserves to live in a beautiful house. Last week, while Maeg was in town, the 3 of us rolled up our sleeves and got to work on Nicki's family room. The house is band new and already pretty awesome, but definitely in need of furniture and decor. 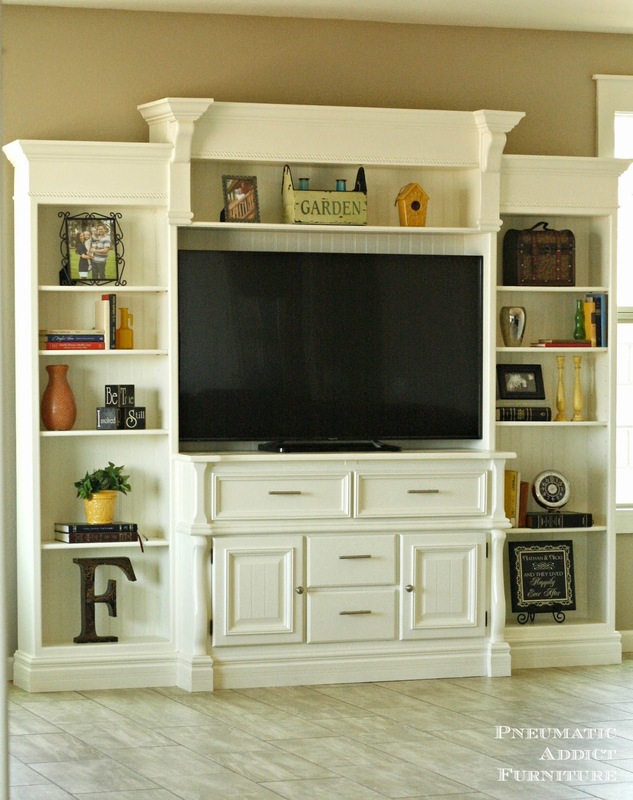 The first task was to come up with an entertainment center for their big a** TV. Whatever we designed had to be HUGE. You can't tell from the photo, but the room is very large and very empty. To begin, we scoured Craigslist to find a base wide enough for the TV, and also picked up a pair of solid oak bookshelves. The goal was to Frankenstein them together and add some height and pretty it up with trim. If you follow me on Instagram, not only are you really cool, but you would have seen my sneak peak while I was working on this project. After about 24 hours of sawing, sanding, priming and painting, here is the final product. I think its pretty fantastic. I originally planned to write a step-by-step tutorial explaining how to build it, but then I realized each build would be unique. It depends on what pieces you start with. 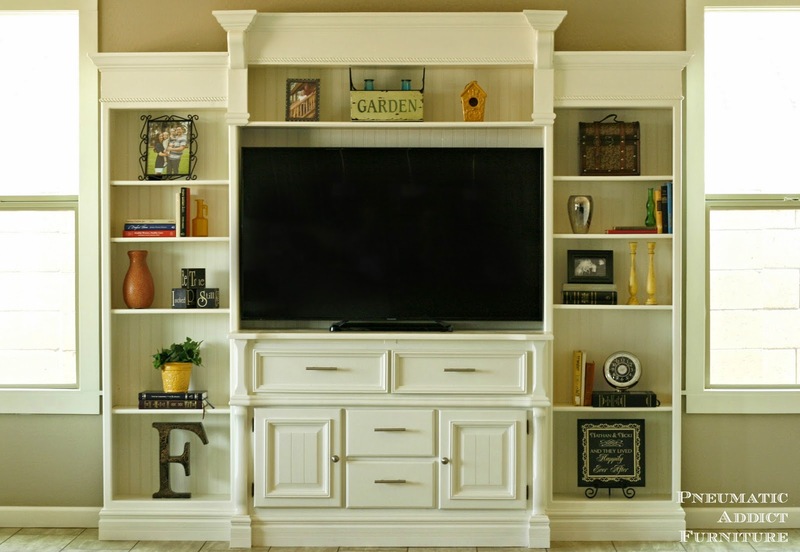 Besides all the decorative trim, it was really easy to assemble. 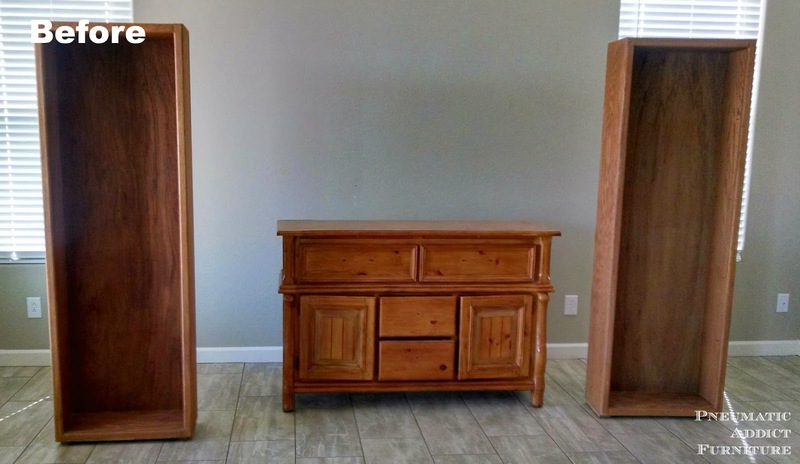 You basically screw a dresser/buffet/cabinet to a pair of bookshelves, build a box from plywood, and stick it on the top. 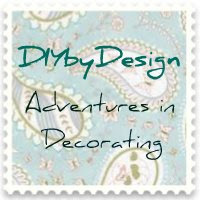 I'll share the tips that I think helped create a cohesive look. 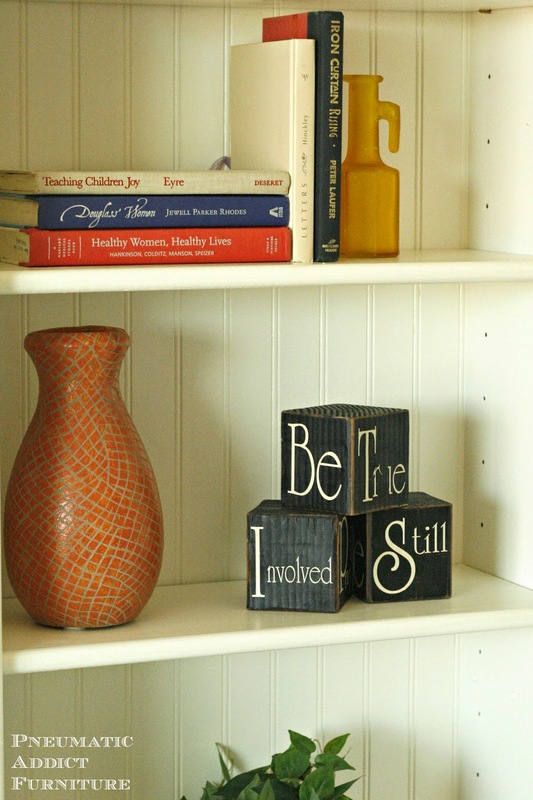 The first thing to do was to build simple boxes from 2 x 6's to raise up the bookshelves. 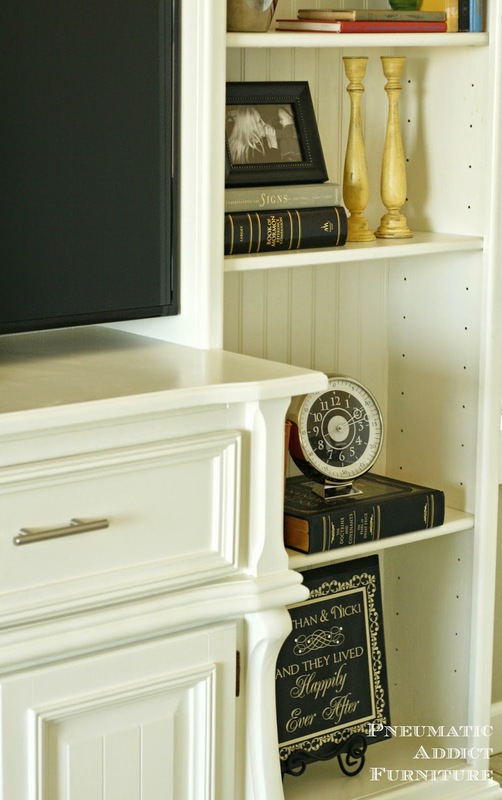 If you are able to find taller bookshelves, you could skip this step. The next job was to notch the top of the buffet. Using a jigsaw, I notched out the overhanging top of the buffet, that way we could slide the bookshelves up flush alongside the buffet. It also allowed the finished edge to extend onto the frames of the bookshelves, helping tie the two together, visually. Adding inexpensive bead board made a huge difference! It spiced up the backs of the bookshelves, while matching the center opening. It matched almost perfectly the detail in the existing cabinet doors. I'll admit, we got lucky with that one. In our case, we did have a couple of really challenging areas. First, wrapping the baseboard around the buffet. If you look closely at the 'before' photo, you'll see that the buffet had curved legs. This is where I had to get creative. Basically, I used a reciprocating saw to hack out a flat spot on the legs for the trim to attach to. If you have ever using a reciprocating saw to cut a clean line, you know its like holding a pencil between your toes and trying to write your name. Good luck. Thank goodness for shims and wood filler. 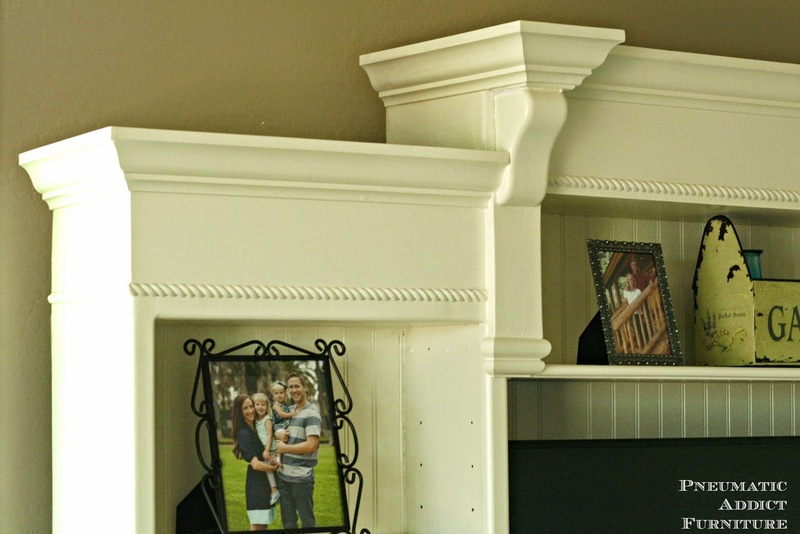 I love the detail these simple corbels add to the top. 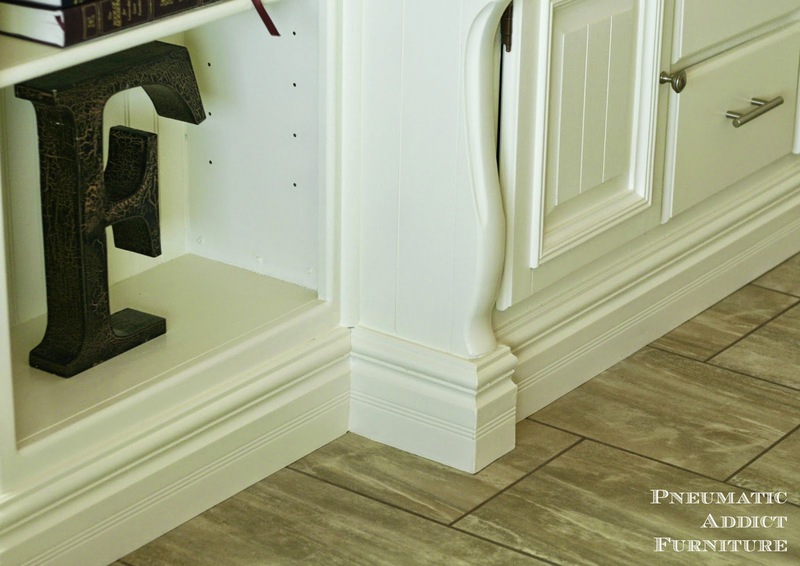 I've found the best place to buy corbels is on-line. You can literally find thousands of them on Amazon . I found a scrap piece of 1 x 4, and attached the corbel and bottom trim. To give myself a place to attach the crown moulding, I cut a top plate from more 1 x 4 and nailed it to the top of the corbel. Then, all I had to do was wrap the crown around and return it. I would suggest simply running the crown straight across the top if you're not very comfortable mitering crown. It can be challenging and requires a double-bevel miter saw. It's definitely do-able. Just practice first or you might end up wasting some pretty expensive trim. And lastly, the best thing to tie all the pieces together is a couple coats of paint. The old saying is true "Caulk and paint make a carpenter what he aint". Make sure to fill and sand all your seams and you can really get a unified look. This particular piece received a coat of primer, 2 coats of latex paint, and 3 coats of PolyAcrylic in satin. Nicki loves the way it turned out! It fits the TV perfectly and really helps fill out the wall. The buffet and bookshelves cost about $140 and we spent another $300 or so in supplies. Not bad compared to what we would have paid to buy a unit this large. What do you think? 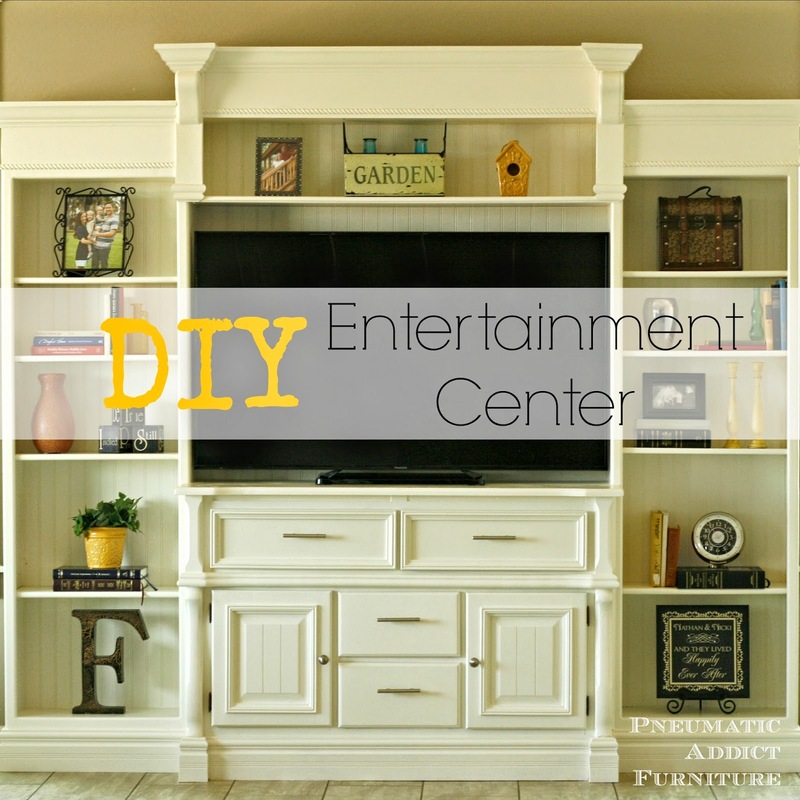 Are you ready to build your own entertainment center? Because you should. that's my kinda project!! Looks great!! You did a great job piecing all that together. You are right, this is pretty fantastic!! I LOVE it, amazing job!!! Wow that looks amazing! I have the dresser and book shelves. I just need to get it made lol I pinned this to try to nudge my hubby in to getting it done. Hi there! Loved the post~you guys did a beautiful job:) I have a question since I am brand new to all this DIY, why the 3 coats of the Polyacryllic? 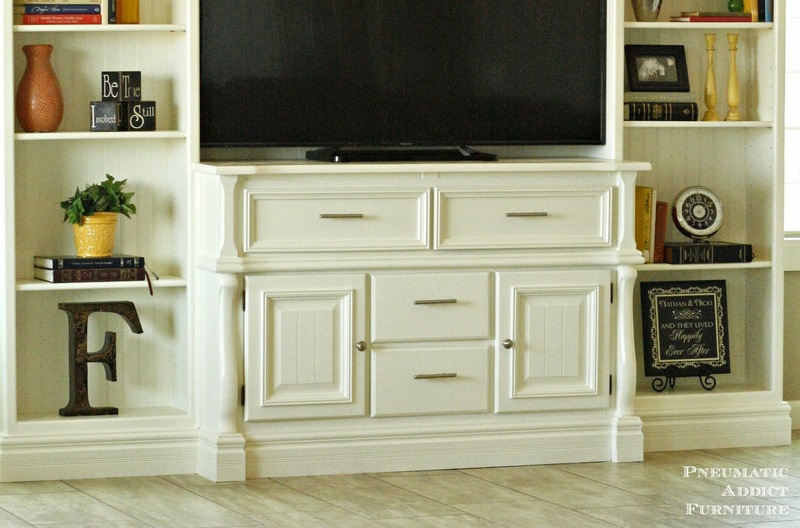 I have been reading a lot about painting furniture-yet to try it, and am gathering info on the best way to do things so I am always looking for advice. Thank you in advance! Thanks Lisa! You always want to seal a piece of furniture after painting it. That way, if there is an impact or abrasion, it with scratch through the clear coat instead of the paint underneath. Its for added durability. If you read the back of the can, most clear coats actually recommend 3-4 coats, lightly sanding between each. The best way to apply any clear coat is in multiple, very thin coats. This way you can ensure even curing and application. You need the multiple coats to make sure the coating is thick enough to give you adequate protection. Hope this helps! Elisha this turned out amazing! I love how the bridge pulls it all together, never would have thought it was an upcycle. This is so cool!I can't believe the before and after! I would love to have you link it up to my Feature Friday Link Palooza! Seriously girl. You are so talented! This is gorgeous! You are so talented. What a crazy good makeover. I will be featuring this tonight at my Sizzle into Summer party. Please stop by and pick up an I've Been Featured button. Thanks. Hi! I'd love to know what kind/color paint you used. This is such a beautiful piece and am amazing idea! Absolutely gorgeous!!! What a fabulous transformation! Can u tell me a little more about the box on top? How did u put it togather?